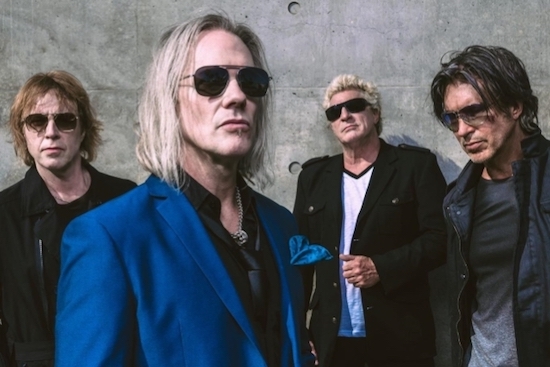 The End: Machine, the new band featuring three members of the classic Dokken lineup — George Lynch (guitar), Jeff Pilson (bass) and Mick Brown (drums) — along with former Lynch Mob and current Warrant singer Robert Mason, will release its debut album in the spring via Frontiers Music Srl, reports blabbermouth.net. Cool name. Better than Superstroke. I’ll check this out. In my opinion, everything great about Dokken was George Lynch and everything mediocre about it is Don Dokken. Pilson and Brown play their supporting roles very well too. This has potential. Yes, those are the best versions of those songs for sure. It’s too bad they didn’t figure out that Jeff and Mick are better singers than Don before they made Tooth and Nail. Maybe they could have been bigger and better than Dokken. But that’s just the way it went down I guess. Here’s what I’d like to see: a co-headline tour of The End: Machine with Jake’s Red Dragon Cartel. I’d travel to see that. Since I’m talking about my wish list, they could maybe get Warren DeMartini involved somehow and make it like a Socal G3. That would be awesome! I love those versions of those songs, and that is such a great CD/DVD. I’m encouraged that Pilson says he’s looking at this as a ‘long term’ scenario. Too many one and done’s these days. This is something that people can get behind. Anything Pilson/Lynch is worth listening to. Add Mick Brown and this has real potential. Check out song writing credits on Tooth and Nail, and you’ll see what I mean. Definitely interested in hearing this one! George, Jeff, and Mick were always the best part of Dokken. And Robert M. is a terrific singer. If it turns out as good as it sounds, I hope that they have enough success so that it becomes an ongoing thing. Mason has a really good voice.